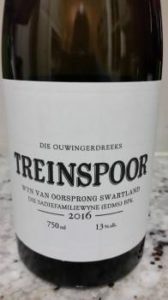 The 2016 vintage of Treinspoor, the Tinta Barocca as made by Eben Sadie from a Swartland vineyard planted in 1974, seems more well behaved and less fringe than some of its predecessors. On the nose, notes of scrub, red and black fruit, black olive and cured meat – all quite subtle and alluring. The palate shows impressive depth without being weighty – pure fruit, moderate acidity and while much is made of how tannic this wine can be, I thought the grip provided here was just right. Very well balanced. Approximate retail price: R280 a bottle.